Requires no installation, just extract the download zip and run. The product is freeware and does not collect any data whatsoever. Worried someone has changed or tampered with your website? 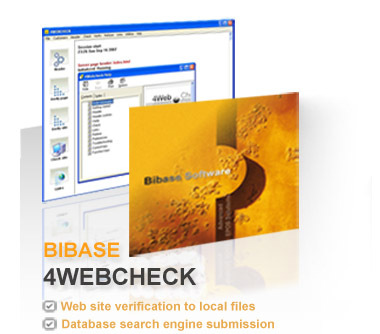 4Webcheck compares website pages to files on a local computer. The program is easy to use with click and go default presets. Just click the Verify menu, Local folder to site option, select the folder, enter the website and that's it. The program will compare single files, all files in a folder or multiple sites and folders. It also features a customer database for link exchange checking and ease of use. Version 56.00. Easy to use interface specifically designed to make operations simple and straightforward. Referrer option to show if a web server offers different pages to requests from difference clients. File comparison and verification of web pages with local files. The referrer check facility may be used to identify if identical pages are served with different referrers. The HTTP server header may be displayed for a domain's default or user specified page. All links, local or non local references from a page can be extracted. A broken link scan may also be performed. The User-Agent may be set from the preferences menu to declare as a preset or custom setting. The product has been made as configurable as possible to allow compliance and interoperability with most web servers. The inbuilt utilties include a visual side by side text file comparison with highlighted differences, a free MD5 file checksum generator and a file byte viewer. Extract the download zip then just double click the program file to run. No changes are made to the registry. The product is freeware and does not use 'nags' or collect any data whatsoever. 4Webcheck provided a convenient and effective intrusion detection software.